This beautifully remodeled beach villa is ready for renting. It is nestled in the luxury gated community of Dorado Del Mar. You will walk out your door to the well-manicured gardens with parrots, many local birds, iguanas, geckos, turtles and the PR favorite the singing "Coqui" tree frog. You will be within steps of the adult and kids pool, lagoon, gazebo and within a block to the beach, boat dock and ramp. Your kids will enjoy the kids pool as well as a playground on the property, while you can enjoy the basketball/volley ball/tennis courts and the villa and public beaches. Inside your 3-story villa will you have everything you need in your full kitchen with all the amenities to serve 8 including a 6 person dining area + 2 bar stools. The villa comes with (6) decks/patios, 2.5 baths and 4 bedrooms, all new beds including a new king-size bed, washer/dryer, new A/C, ceiling fans in each room, large walk in showers, internet, (2) new flat screen TV with blu-ray DVD player, DVDs, stereo w/CD player, as well as, all the linens and towels you can use. 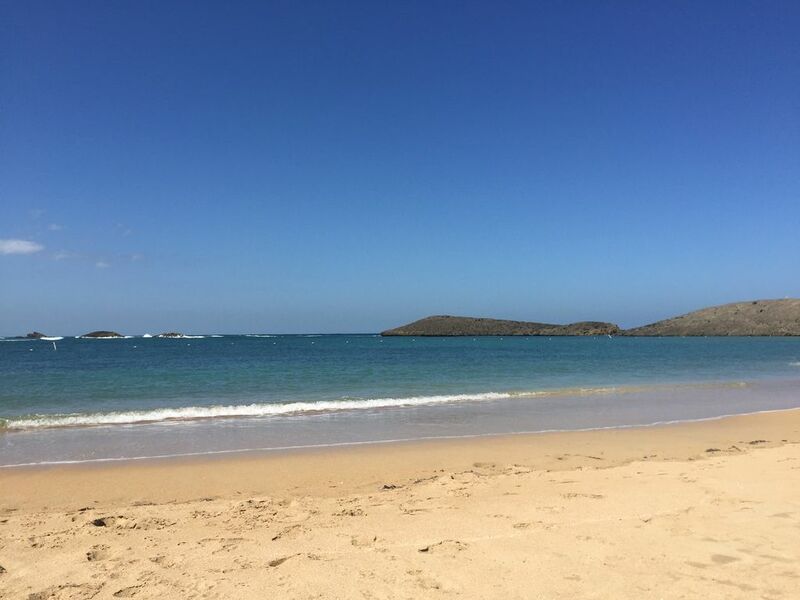 You will be at the most favored vacation site (Dorado) for tourists and locals alike on the island of Puerto Rico. You have many beautiful beaches, (4) championship golf courses, extensive shopping, restaurants and cinemas within a couple miles. This is an adventurer's dream vacation with coral reefs, zip-lines, bioluminescent bays, limestone caverns and rain forest with unique animal/plant species totally unique to Puerto Rico. You have access to a 24-hr Walgreen's, CVS Pharmacy, fast food restaurants (Applebees, McDonald's, Wendy's, Taco Bell, Pizza Hut, Subway and Baskin Robbins within 1 mile) as well as local dining. This property is an easy 22 miles of expressway to Historic downtown San Juan or the International Airport. The water at the tap is treated city water but as a precaution we installed at the kitchen sink a water treatment system, as well as, a 2nd filter to ensure safe drinking. Compare airfare and lodging for any tropical safe and clean vacation. Know that you are still in the US (currency and traffic laws). You will not need a passport - US driver's license will work just fine. Don't worry about solicitors. You will feel welcome by the locals and this property. This is unbeatable. Our goal is to provide you a relaxing, safe and fun home away from home. english, Know a little Spanish. An interpretor for others. I buy and sell properties in the Colorado and now Puerto Rico. My husband is an Environmental Scientist and focuses on water quality and biology. You will find this newly remodeled 3-story villa clean, updated and comfortable for 8 people. Extras include some toys, new blue-ray DVD player, (2) flat screen televisions, stereo with CD player, small DVD collection and books, cable TV and wireless internet. Excellent ground water quality delivered by limestone formations in the area. New comfortable foam beds will make your trip complete, including (1) king size. You will have an expandable dining room table for (6) and (2) bar stools. New construction brings you a 4th bedroom and 2nd deck with overhang and privacy. Proximity to really nice pool and short walk to multiple beaches. You overlook a well manicured garden with parrots, many local birds, iguanas, geckos, turtles and the PR favorite the singing "Coqui" tree frog. You will find everything you need in your full kitchen with all the amenities to serve 8. In addition, your bedding, towels, soap are provided. New air conditioning, king and queen bed, outdoor and beach furniture. Just bring your clothing and toiletries and you will be set for a relaxing and reasonable vacation for you and your group/family. At our villa you will find filtered drinking quality water at kitchen tap. No need to buy bottled water. Compare airfare and lodging for any tropical safe and clean vacation. Know that you are still in the US (currency and traffic laws). You will not need a passport. Don't worry about solicitors. You will feel welcome by this property and the locals. This is unbeatable. Less than one mile from the center of old-town Dorado. Secured gated beach-front access with boat ramp, dock, excellent swimming area with reefs and surf areas nearby. Many oceanfront restaurants and bars in walking distance. Includes laundry soap and placed outside kitchen to reduce heat. High speed. English speaking channels with world sport channels such as rugby and soccer. In the unit and at the pool. On TV and also a couple CDs. (4) Championship 18-hole courses in Dorado. (4) of them ranked best in the Caribbean. Great location for beaches and dinning. Very comfortable! The four bedroom condo was cute and in a great location. We went there on a golf trip close to all the golf courses beaches and restaurants. The kitchen is fully stocked with everything to make meals. That really worked well for us. The master bedroom is an open floor plan. With no closing door. The fourth bedroom is an add-on in the master bedroom and you have to share a bathroom that does not have a door. There’s no privacy in the master bedroom at all! The owner Joan was very helpful and informative the entire time before we got there. This property would be great for a family. Great location and great host!! My husband and I stayed at Joan's villa while we were in Puerto Rico working. She is a great host with attention to details and we thoroughly appreciated her recommendations and information. Evening walks, the coquis, the sunset...it was all so beautiful! The place is comfortable and big enough to spread out, which is what we did. I had the entire 2nd floor as my closet! It was great! We will mostly likely bring our family next time as we would all fit perfectly! Everything went very smoothly so will definitely be back. Thank you so much for staying with us. It was our pleasure. We look forward to seeing you again when you have time to be in Puerto Rico once again. My family and I visited PR for my parents 50th anniversary celebration. From the time we made the reservation to the date of our departure, Joan (the owner) was very responsive to my questions and helpful when it came to asking about other information such as dive excursions and bio-bay tour companies, etc. She definitely went out of her way to make sure we were well prepared for a great trip. The condo was very clean and enough space for the 8 of us overall (tall and narrow building--upstairs 2 bedrooms are up two flights of stairs so may not be good for anyone with physical needs) but there are 2 other bedrooms on the middle level to choose from. We loved the patio outside looking out to the community courtyard. It was definitely an enjoyable place to spend time relaxing outside and it helped that it was covered to shelter us through the occasional rain shower. The pool area was large with clear, clean, water. The beach was within a 5 minute walk to the other end of the community once you reached the "main entrance" area. It was a little difficult to find (because the first open gate area gives only access to a small beach), but follow the white gate around the road to the 2nd opened fence door. This open gate gives you access to a longer beach that is great to walk along and there are a couple of local outside restaurants/bars that have good food and frozen drinks. Don't give up on finding this access to the beach because it is there. The water is beautiful and the view gorgeous, but I will say that walking along the sand there was a significant amount of trash that we're not necessarily used to from the beaches in the U.S. and it's too bad that the community and local people living there are not better able to take care of and maintain the beach area to be free of debris. Obviously this is not a reflection on this property or the owner specifically but it would make for a better experience. The condo is about 30-40 minutes west of the city of San Juan, so if you're wanting to be closer to that area just be aware of this; but it is an easy trip along highway and it is located very close to many restaurants, small stores (Krispee cream donuts, Baskins Robbins, CVS, etc.). Overall, we enjoyed our stay very much! I appreciated the checkin and checkout flexibility as it made our vacation less stressful. The house was good, spacious, clean and easy to access. Thank you so much for staying with us. We look forward to seeing you again when you travel to Dorado. I hope you and your family enjoy 2019. Has 2 more floors above main. Kind of steep. So be careful. Lol. Enjoyed the pool and near by beach. We had a good time at the Villa. It had everything you will need to have a relaxing time in Dorado. Thanks for your hospitality, Joan. Thank you so much for staying with us. We appreciate the opportunity to host you this month and look forward to having you join us in the future. If no damaged is caused, your security deposit will be returned within 7 days of your check-out. If extensive damage is caused to the villa, a local police officer will be called to investigate the damage. If you do not follow-through on your last payment, your initial payment will be forfeited.